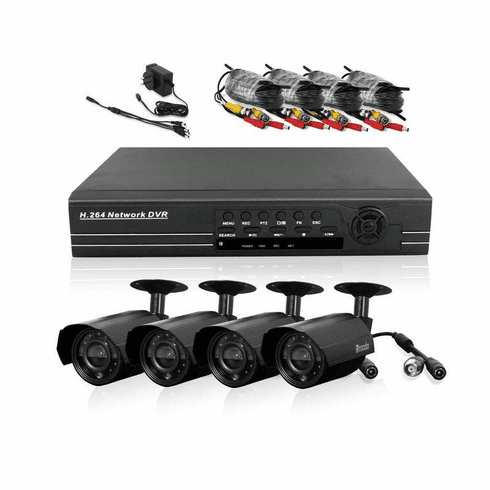 The PKD-DK80207-500GB kit includes an 8 CH H.264 standalone DVR and four outdoor security cameras providing everything you need to have your surveillance system up and running in your home or business quickly and easily. The DVR-H8118UV is an 8 channel, fully integrated, real time, and hardware based standalone digital video recorder. This standalone DVR is based on an embedded Linux operating system and includes a remote control for easy setup and operation. With network access, VGA video output, and USB2.0 backup, this DVR is perfect for the home or small business. The DVR also features the most updated 3G mobile live! Preview via mobile phone. The cameras included in the kit are 1/4" color CMOS IR night vision outdoor cameras. All cables and power supplies are included. * 8 CH H.264 Surveillance DVR * H.264 Hardware Compression * Video Input / Output: BNC 8 / BNC 1 * Audio Input / Output: RCA 1 / RCA 1 * Two Type Video Out: TV Monitor BNC Output and PC Monitor VGA Output * Signal System: NTSC / PAL * Display: 240 fps * Record: 240 fps * Remote Access: Internet Explorer or Netviewer Software * Sensor/Alarm: 1-CH Input/ 1-CH Output * PTZ via RS485 Port * Support Remote View via Smart Phone & 3G Mobile: a) iPhone & #153; 3; b) Google Android & #153; 1.5-2.1; d) Windows Mobile & #153; Pro 5.0 or above; e) Symbian & #153; S60 3rd & S60 5th. We prefer payment via Paypal. All returns accepted. Your buyer should contact you within 30 Days after receiving the item. Refund given as Exchange Return shipping will be paid by your buyer Additional return policy details: The buyer has 30 days to return the item (the buyer pays shipping fees). The item will be Exchange. *Please noticed scratches, dents or other forms of cosmetic damage which can't be a return reason for the refurbished or used products. All returns must include a vilid RMA#. You must send e-mail to us via eBay to obtain a Return Merchandise Authorizaion ("RMA") number within the guarantee return period for the products. We will not accept returns without prior RMA#. RMA# is only valid for 15 days. Customer should prominently display the RMA# on the shipping label of boxes containing the returned product. Customer is solely responsible for all shipping/return-shipping cost. All returned products must be 100% complete, in re-saleable condition, and will include the original accessories. Merchandise will be considered out of warranty if physical damage is found on returned items. Shipping and handing will be calculated when you check out. So far we only offer: Standard Ground service(2-7 Days). Urgent case please email us via eBay to request better shipping service. Import duties, taxes and charges are not included in the item price or shipping charges. These charges are the buyer's responsibility. Please check with your country's customs office to determine what these additional costs will be prior to bidding/buying. There is extra shipping charge for heavy weight items if shipping to address in HI, AK, PR, VI, APO, FPO, or other US Territories Please contact us for shipping cost.